Each name has each vibration. Even if some people’s date of birth is not well, their name provides them benefits. Bad names provide bad result. You will receive many benefits by changing your name according to your date of birth. The alphabets (English Letters) in your name have equivalent numbers. By adding them (totaling the numbers of the name) the benefits are determined. 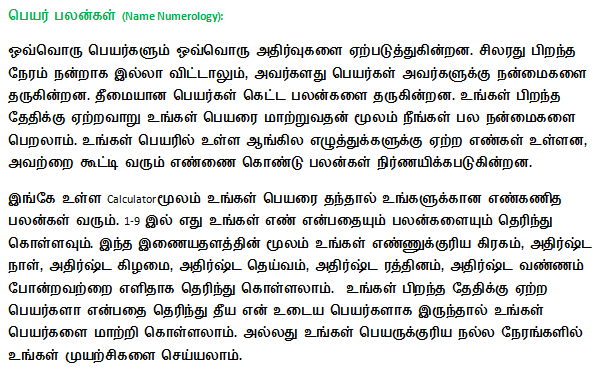 Through the calculator here you can give your name and get your numerology benefits. Get information like which is your number (from 1to 9) and benefits. Through this website you can easily get information like your numerical planet, lucky day, lucky god, lucky stone / stone and lucky color. You can check whether your name is suitable for your date of birth. If your name has bad benefits / bad vibration then you can change your name. Or you can try out things in good time / auspicious time of your name.